Petition calls for all armed feds to turn in their guns. Read the petition and sign it here. In response to criticism of NRA VP Wayne LaPierre‘s suggestion that armed guards be placed in schools following the Sandy Hook massacre and the double standard presented by the Gun-Free School Zones Act of 1990, nationally syndicated radio talk show host Alex Jones has posted a petition on We the People: Your Voice in Our Government, the federal government’s petition website. Journalist Alex Jones and Infowars.com are calling for President Barack Obama to issue an executive order amending the Gun-Free School Zones Act of 1990. The executive order will establish the White House, all federal buildings and federal events as gun free zones and all federal security personnel will turn in their guns. We also demand the order apply to private schools such as Sidwell Friends School attended by the president’s daughters. This petition is a response to government and corporate media dismissing a call for armed guards at schools following the Sandy Hook shooting. Jones and Infowars.com believe there should not be a double standard. If the government believes gun free zones are a solution for citizens, the same standard should apply to government servants and employees. “Since the government has bought over a billion rounds of ammo and armed vehicles and is hardening facilities, we are calling for them to all to turn their guns in, including all federal police… and the military,” Jones said on Friday prior to the petition post on the White House site. The petition follows remarks made by corporate media host David Gregory over the weekend. Gregory criticized LaPierre for his armed guards in schools idea. Following Gregory’s dismissive remarks, it was reported that the Meet the Press host enrolled his children in an elite school – the same D.C.-based Sidwell Friends attended by Obama’s children – where students are protected by no less than 11 armed security guards. Jones said on Friday that if the government truly believes in gun free zones, Obama should insist that Sidwell Friends and other elite schools disarm in order to comply with the federal law. “Because, according to them, that’s what makes us all safe,” Jones told Infowars.com. 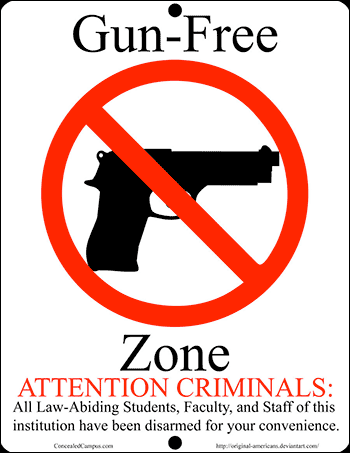 Proponents of gun free zones and the 1990 law mandating them never mention the fact that mass murderers specifically target defenseless schools, theaters and malls because they know there will be little resistance to their rampages if a defense-free rule is in effect. Despite Gregory’s dismissal and that of government officials and the corporate media, hiring armed security guards — and in lieu of that allowing teachers to carry firearms — is the only rational solution to mass shootings at schools. For some time now teachers in Israel have carried firearms in response to terrorist attacks. “Two (armed) teachers would have kept (the Newtown shooter) occupied for 45 seconds each,” Oren Shemtov, CEO of Israel’s Academy of Security and Investigation, told Fox News on December 27. During his Sunday Show, Alex originally called for a government gun free zone and others posted petitions on the White House site in response (see Eliminate armed guards for the President, Vice-President, and their families, and establish Gun Free Zones around them). On Friday, Infowars.com journalist Adan Salazar covered this petition. Video: Superintendent David Thweatt created what he calls a “guardian plan” that allows firearms in the classroom. On Friday’s show, fill-in radio host Mike Adams “The Health Ranger” asked Alex Jones about his latest petition pointing out the double standard in making normal citizens’ schools gun free zones, while the president’s and other politicians’ children go to a school secured by at least 11 armed guards.